In this page combined figures we are going to see how to find the area and perimeter of combined geometric shapes. In our day to day life we see many combined shapes of triangle, rectangle,square and semi circle. 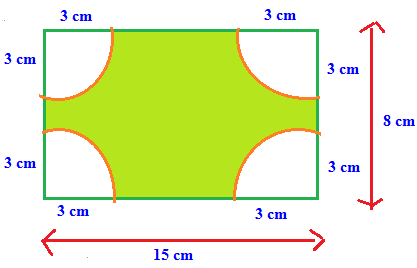 To find the area and perimeter of such figures we need to calculate the area separately and then we can add them. 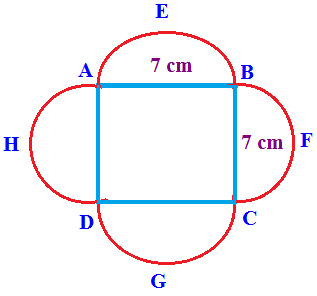 In the above figure we have four semi circles and one square. To find the perimeter of the above figure we have to add the sum of four semicircles and a square. Diameter of each semicircle is 7 cm from this we can find the radius of semi circle. Find the area of shaded portion.